The Los Angeles Clown Company has been working in the greater Los Angeles Area for over a decade! We are best clown company in the greater Los Angeles area and have served over 50,000 kids in parks, schools, restaurants, business and the birthday boy or girls’ own backyard. Check Out Our New Site and Our Services! Our basic one hour party plan includes: The Los Angeles Clown Company has been working in the greater Los Angeles Area for over a decade! We are best clown company in the greater Los Angeles area and have served over 50,000 kids in parks, schools, restaurants, business and the birthday boy or girls’ own backyard. Gilly the Clown is available for Film and TV bookings and has experience on shows like Modern Family, Parenthood, and more. Additionally, as much as he loves entertaining in person he loves to put together live theatrical events and film shorts. Gilly knows that not all folks are fans of the full face makeup and for some it can be a bit scary. So Gilly has his low makeup look ready for the Southern California sun to keep everyone happy. Check out other options for your clown party at the button below. Gilly the Clown Loves Games!! Our basic one hour party plan includes: Magic Balloon Sculpting Games Music Face Painting Activities with a Parachute and a Tunnel. Click the Button for info on Packages and Rates! Juggling, Check! Sing-a-longs, Check! Balloon Animals, Check! Jokes, Check! Gilly the Clown loves to entertain. 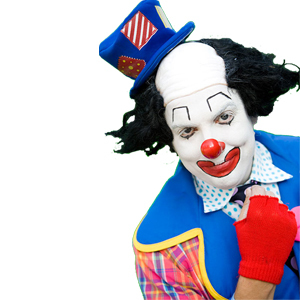 Gilly the Clown (Chief Executive Clown) has performed over 3,000 parties alone and is known throughout the Los Angeles as not only a standout clown and kids performer, but a working clown on shows like Glee, Big Time Rush and Modern Family, web content with BuzzFeed and Maker Studios and over 3 dozen commercials! His bread and butter is bringing you the best possible clown for a kids birthday! He uses clown staples such as balloon animals, magic shows, face painting, juggling, hat tricks, stilt walking, parachute games and more.